Having a growth mindset helps. Research shows that parents can have a powerful impact on their childrens’ mindsets. The language you use and the actions you take show your children what you expect. Giving process praise, talking about the brain, accepting mistakes as learning opportunities, and understanding the role of emotions in learning are all practices you can begin today. The way we praise our children can have a profound impact on their mindset. Research on praise and mindsets shows that when we praise children for being smart, it promotes a fixed mindset. It sends a message that their accomplishments are trait-based, and tied to something innate. In contrast, praising kids for working hard promotes a growth mindset. It sends a message that the child’s effort is what led them to success. Want more tips on what to say, and what not to say, when praising your kids? Say This, Not That! Say this because it helps your children understand you value their effort. Do not say this because it makes them think of intelligence as a fixed quality. Say this because it lets your children know that they control outcomes by making choices. Do not say this because it makes your children think they don't have the capacity to improve. Say this because it conveys a message of approval of an activity they enjoy doing, regardless of outcome. Do not say this because the next time your children fail or make a mistake, they might think they do not have that talent after all. Say this because it teaches kids that learning should be challenging, and if tasks are too easy then your brain isn't growing. Do not say this because praising tasks completed without much effort paints effort in a negative light and encourages a fixed mindset. Say this because it's important to be honest about what your child knows and doesn't know, but also explain that you believe in their capacity to improve. Do not say this because the fight or flight response may be preventing your child from giving their best effort in class. Say this because reminding children of how they were able to overcome challenges by putting forth a lot of effort cultivates a growth mindset. Do not say this because there will always be more challenges, and children should feel that they have the tools for what comes next. Say this because putting your children in the challenge zone is how to inspire lifelong learning. Do not say this because if you only encourage your children to do what they're good at, they'll be afraid to take risks and learn new things. The brain is far more malleable than we once thought. Teaching our kids that they actually have control over growing their brains through the actions they take is empowering! Tell your children that when they work hard, that’s the feeling of their neurons connecting. The dendrites are reaching out to other dendrites, trying to connect to make a stronger brain. What strengthens those connections is practice, asking questions, and actively participating in learning. When children learn that their brains physically change with effort, it leads to increased motivation and achievement. Show your kids this Brain Animation video to explain! One of the best ways you can model a growth mindset is to speak candidly about the mistakes you’ve made, and what you’ve learned from them. Speak positively about your mistakes and struggles, and this will show your children that taking risks and making mistakes are a natural part of the learning process. Explain to your children that trying hard things is what helps us grow, and you can’t be perfect when you try something hard! When we get angry, scared, or feel threatened, our fight or flight response is activated. This can happen anytime, whether we’re scared of a spider or scared of math! Our brains are wired to protect us when we feel threatened, and stress symptoms such as sweating, stomach cramps, and your mind going blank are completely normal. There are strategies we can use when the fight or flight response tries to take over, to help us learn. 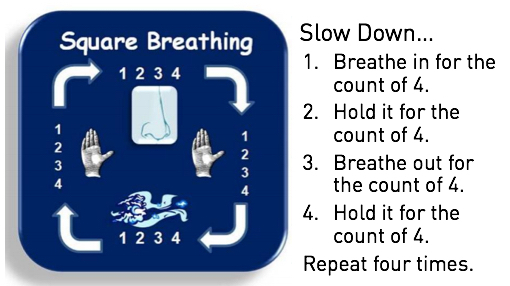 One of those strategies is called Square Breathing and it helps to break down the adrenaline that is flooding the bloodstream and preventing learning from occurring. You can find other videos and resources from the Greater Good Science Center at their Half Full Blog.